Finally I'm home after a whirlwind Cycle Chic tour of Japan and Moscow. 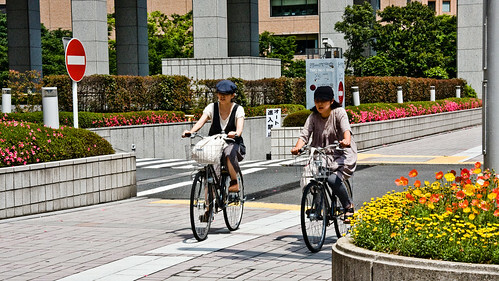 Expect Japan Cycle Chic and Moscow Cycle Chic for the next little while. I'm loving her heels on the above photo as she swishes through Shibuya. Why not whistle why you ride? Hats are all the rage in Japan. Many cloche hats for the girls and panama style hats for the boys. The Japanese are so deliciously fashionable. Although waiting for a red light in style is universal. Indeed, why not? In fact for about the past week just getting on my bike has given me the uncontrollable urge to whistle The Flowers of Edinburgh; and I haven't bothered trying to control it. My Scottish Snap isn't too bad, but I need to work on my rolls. I remember seeing a lot of guys with straw fedoras there when we went last summer - great for the summer heat there (goodness was it hot and humid)! We left feeling like Japan was a very fashionable place as well - even the elderly dress very nicely in current fashion, it seems. 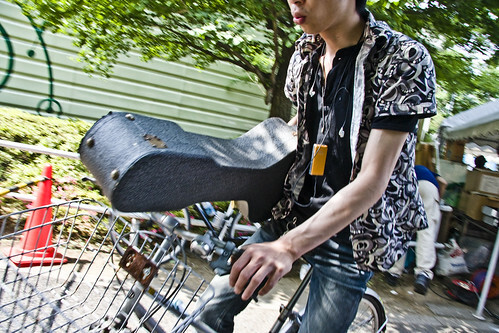 And it was fun getting to dress in kimono as well :) I didn't, however, get to ride a bicycle there, which is a shame. love all the Japanese pics, keep posting!